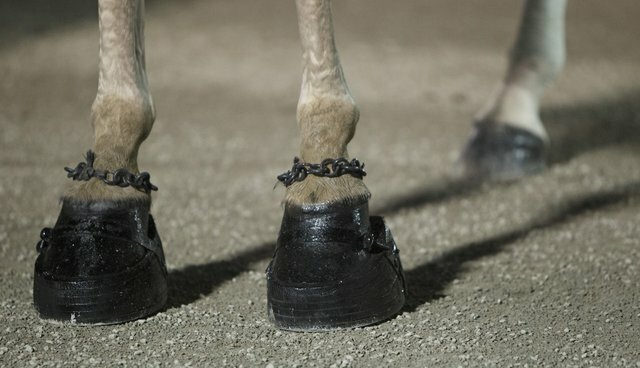 If there was any doubt about rampant corruption in the Big Lick sector of the Tennessee walking horse show industry, the latest test results from the U.S. Department of Agriculture (USDA) put all of that to rest. As in prior years, the cheaters, scofflaws, and horse abusers were out in force and they were the big winners of last year's Tennessee Walking Horse National Celebration in Shelbyville, Tenn.
Data recently released by the USDA revealed that 52 percent of horses the agency randomly selected for testing were found positive for illegal foreign substances at the 2014 Celebration, the walking horse industry's marquee event. Several of the foreign substances detected are known to be used in the soring process – the practice of deliberately injuring a horse's legs and hooves to force them to perform an artificial, high-stepping gait – or used to hide evidence of soring. When you consider that there were far fewer horses shown at the 2014 Celebration than in 2013 or in many years prior - likely because owners and trainers inclined to flout the rules pulled their horses from the show before inspection to avoid being caught – the rate is striking. Imagine if 52 percent of pitchers in the World Series, cyclists at the Tour De France, or running backs in the NFL playoffs were caught using illegal substances? There would be recriminations, investigations, and people ousted from the sports. Executives would be fired, and team owners stripped of their ownership rights. But not in the show world of Tennessee walking horses – there, it's business as usual. The USDA's foreign substance testing results come just months after the agency released a report revealing 219 violations of the Horse Protection Act among 1,075 horses inspected at the 2014 Celebration – double the number of violations found at the 2013 event. Even the Celebration's own newly minted Veterinary Advisory Committee (VAC) – which itself was little more than a sham, with one of the three veterinarians not even apprised that he had been selected and the other two appointees firmly in the Big Lick camp – found problems with non-compliance. According to the VAC's blood-testing program at the 2014 Celebration, 36 of the 230 horses sampled were found in violation, having been administered one or more of the substances prohibited by the VAC. The VAC's list – separate and apart from the USDA's list of banned soring chemicals – was published weeks before the Celebration. The VAC even provided a corresponding clearance time for each prohibited substance, so entrants would know just how much time was needed for a particular substance to pass through a horse's system, and still trainers tried to cheat their way to a blue ribbon and some name recognition. The VAC released the names of 30 horses it found in violation. Of those, 11 were named world grand champions; 14 other horses placed first in at least one class entered at the Celebration. It's shocking that such a high percentage of horses were found in violation during inspection at the Celebration, and that so many that had been passed through inspection and cleared to compete were later found to have been administered prohibited substances but still permitted to keep their titles. In no other sport – equine or human – would this be allowed to stand. It's indicative of the degree to which participants will work to hide the indefensible torment of horses in an industry where cheating is rampant – in fact, it's the name of the game. The VAC blood testing results combined with the USDA foreign substance results leave no question that soring and the concealment of soring is a systemic problem that corrodes every fiber of the Big Lick horse industry. The denials and the umbrage taken by the Big Lickers about our efforts to see the federal anti-soring law strengthened are hollow protests from a deeply corrupted faction of the industry. The recent election of Billy Young as the new president of the Walking Horse Trainers Association underscores this fact. The WHTA claims to be an organization committed to promoting and protecting the welfare of the Tennessee walking horse. Yet, it elects as its leader someone with a history of citations for violations of the Horse Protection Act. Young was just suspended at the 2014 Celebration for a violation of the HPA, and in July 2013, he was charged by the USDA under the Act. He entered a consent decree and was disqualified from participating at horse shows for eight months. He was represented in the case by a Shelbyville, Tenn. attorney Jack Heffington – who himself just recently entered into a consent decree stemming from a 2012 USDA complaint under the HPA and was likewise disqualified, for seven months. Young's election is a clear indication that the WHTA is either unable or, more likely, unwilling to be led by someone who is not entrenched in the horse soring world - and that the Big Lickers have no interest in moving toward sound horse practices and the preservation of the walking horse breed. The Big Lick segment of the walking horse industry simply won't clean up its act, despite having had nearly four decades to do so. Legislation is necessary to eliminate the industry's failed system of self-regulation, strengthen penalties against those who break the law, and ban the devices used in the soring process. The 113th Congress failed to pass the Prevent All Soring Tactics Act, despite the fact that 60 senators and 308 members of the House (including a majority of the majority) cosponsored the bill. We're calling on the 114th Congress to take up this measure without delay upon its reintroduction, and end half a century of intentional abuse to a great American horse breed.